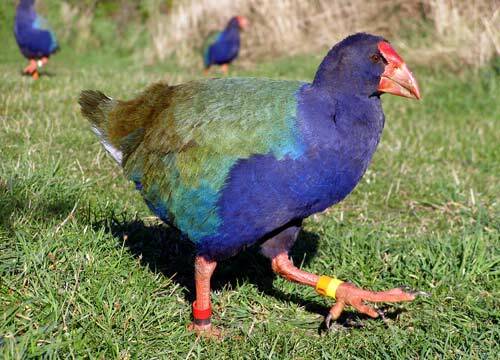 The incredibly rare takahe bird is arguably Te Anau's biggest draw card. It is an incredibly rare endemic bird. There are only about 200 left in the wild, living high up in the Murchison Mountains opposite Te Anau on the other side of Lake Te Anau, in Fiordland National Park. Immense efforts are being taken to protect them in this wild place from invasive, non-native predators, particularly stoats and rats. There is an intensive trapping programme in operation in the Murchison Mountains. To emphasise the importance of this fabulous bird to the Te Anau community, there is a giant fibre glass model of one near the lake front which is great for family photo calls. But don't think this is the closest you are going to get to one. 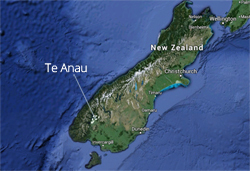 The great news is that you have a very good chance of seeing one right here in Te Anau, at our bird park (officially known as the Wildlife Centre but the only creatures in it are our endemic birds). To get to the park, you can go on a leisurely stroll south on the lake front, past the yacht club. Entry to the park is free and the large Takahe enclosure is clearly marked. There are many other rare New Zealand birds you can also see in the park. Please make a donation in one of the donation boxes. For more information, visit the web page of the park on the Department of Conservation website.